These Dogs Are in Danger and You Can Help! 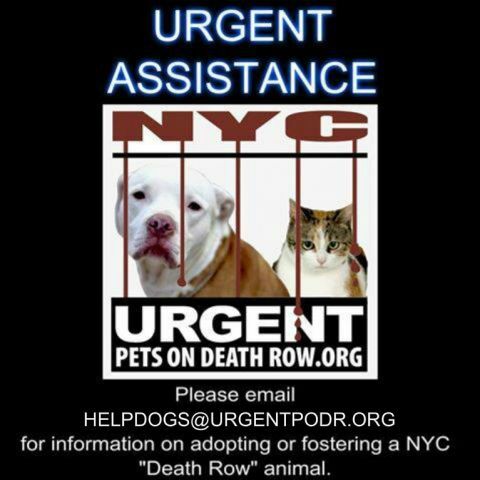 Please take a look at these dogs at nycdogs.urgentpodr.org who are in urgent need of forever families or foster homes. The shelters in New York City are severely overcrowded, which has forced them to put down perfectly healthy and adoptable animals each and every day in order to make room for new arrivals. The creators of Urgent Pets on Death Row have set out to find these animals loving homes before it is too late. Every night a "death row" list is updated to include a new set of dogs designated to be destroyed the following day. You can make a difference. Please share a link to this page and remember to check back daily to help save the lives of these helpless NYC pets.